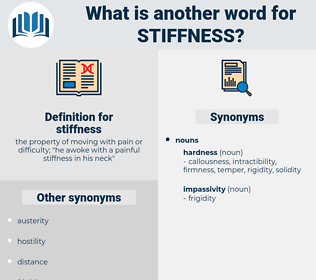 What is another word for stiffness? 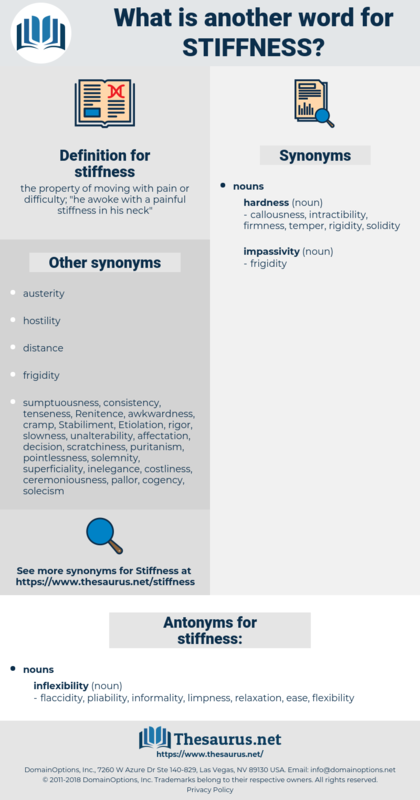 the property of moving with pain or difficulty; " he awoke with a painful stiffness in his neck"
flaccidity, pliability, informality, limpness, relaxation, ease, flexibility. When young, there is no stiffness in the legs.
" Its stiffness, if that's what you mean," Carroll answered with a smile. stiffening, Stefan Zweig, stovepiping, stevens, stooping, stupefying, steffens, stuffing, stabbing, state bank, stuffiness, steepness, stopping, skydiving, stubbiness. clumsiness, resoluteness, inelasticity, resolution, firmness, awkwardness, firmness of purpose, resolve.